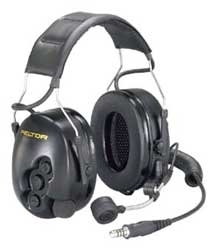 3m Peltor Tactical Pro Two-Way Radio Electronic Ear Muffs feature a 26 NRR for excellent noise protection, a built-in microphone and sensor in each ear cup, connected to onboard electronics that amplify low level ambient sounds while compressing dangerously loud noises instantly, for true stereo sound that provides extraordinary situational awareness and the ability to hear better with Tactical Pro on than with the open ear. A boom mic and fixed downlead allow you to connect Tactical Pro to your own two-way radio. The fixed downlead is terminated with a sturdy TP-120 male plug that plugs into a PTT adapter (sold separately) which in turn attaches to your two-way radio. Tactical Pro, without boom mic and fixed downlead is also available. See below.